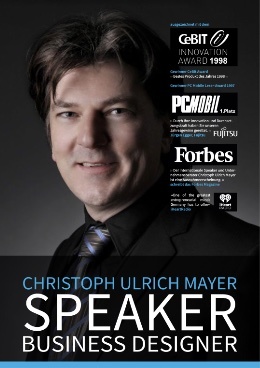 After his university degree in Augsburg, Christoph Ulrich Mayer built up several own companies, became the owner of 6 pioneering patents, established them in various industries and conquered large market shares. After a short time, he placed one of his developed products among the top 10 in international cutting-edge technology, for which Mayer was awarded the CeBit-Award for the product of the year in Hanover. At the same time, he became an international manager and management consultant of the world’s largest global player and market leaders. Mayer is not allowed to discuss most of his mandates publicly for understandable reasons. The same applies to the names of the consulting top managers – no comment. Today, Christoph Ulrich Mayer speaks to small and medium-sized companies, both nationally and internationally, as well as at events and conventions at national and international corporations around the world.